This institute, which has a collection of unique cultures in Latin America, is dedicated to the study of lactic bacteria. Authorities during the videoconferencing. Photo: CONICET Photography. Through videoconferencing, Argentine President Dr. Cristina Fernández de Kircher and the city of San Miguel de Tucumán inaugurated Centro de Referencia para Lactobacilos (CERELA) [Reference Centre for Lactobacilli]. This institution is a double-dependence centre between the National Scientific and Technical Research Council (CONICET) and the Miguel Lillo Foundation. 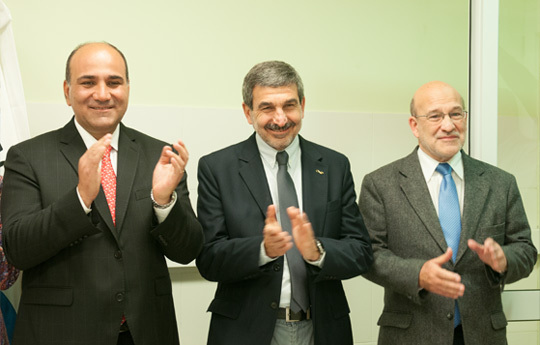 The event was held at the new building and was presented by Deputy Governor Dr. Dr. Juan Manzur, the president of the Council, Dr. Roberto Salvarezza and the director of the CERELA, Dr. Graciela Font. The new facilities at the CERELA include R&D laboratories to produce prototypes (functional food, biproducts, bioingredients, pharmabiotics). The Ministry of Science, Technology and Productive Innovation (through the National Agency for Science and Technology Promotion) and the CONICET invested ARS$5.898.640 for the extension of the institute. This institute for Scientific and Technological Development focuses its applications on food and human and animal health. The lines of research are: the design of new lactic fermentations and probiotics, lactic bacteria’s studies on human and animal health; and the metabolic, physiological, and genetic mechanisms of lactic bacteria. It is worth mentioning that technology transfer to the productive sector has led to the development of three products marketed by national companies: LecheBIO, BIOflora and Actioferm. Currently, the CERELA has 35 researchers, 31 fellows, 17 technicians and 4 administrative assistants. Furthermore, during the ceremony at the Casa Rosada Presidential Palace, the President gave the “National Researcher Award” to Gustavo Politis, CONICET researcher and the director of the Instituto de Investigaciones Arqueológicas y Paleontológicas del Cuaternario Pampeano (INCUAPA, CONICET–UNCEN) [Institute of Archaeological and Paleontological Research of the Quaternary Period of the Pampas Region]. The prize, which is part of the National Popularization of Science and Innovation Programme, was organized by the Ministry of Science in order to acknowledge the work of the most outstanding researcher of the scientific system.